Pontsho means “Vision” while Kesenogile means “I am revealed”. 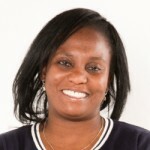 In 2008 when she joined World Vision South Africa (WVSA), she was the first person to be hired as a full-time Gender and Development Coordinator and she has recently transitioned to be the Technical Manager responsible for Child Protection, Spiritual Nurture and Participation. I remember when I came for a follow-up interview after seeing the advert for this position in 2008 and I was asked what it is that I bring that will be unique and I jokingly said that I bring my individual vision which will be merged with the World’s Vision. I even asked how many other people could claim to share a name with the organisation they were about to join. The interviewers laughed. And basically that tells a story of who I am – even though I’ve always worked in the highly charged environment of addressing gender based violence (GBV), I have not lost my sense of humour. It is actually what has helped me survive plus of course the knowledge that God is always in control, regardless of the circumstances. I have been passionate about gender issues, especially the plight of women and girls in relation to GBV and how it interfaces with HIV and AIDS, from the time I joined the women’s movement. I saw the possibility of working in World Vision as an opportunity to bring my two loves together – God and gender! Where I’d worked before, our frame of reference was feminism and we did a lot of activism around gender equality while working mostly with women. As a born-again Christian, I’d been hesitant to think of myself as an activist for equality as I assumed the Bible didn’t advocate for gender equality. One of the memorable things from my first year of service in WV was the discovery that Jesus, our Lord and Saviour, God who came in the form of a male, was a gender activist Himself. Here was a man who treated women as equal and He was the centre of my faith. When I realised this, it was suddenly clear that having a vision where men and women, boys and girls are equal is not a pipe-dream but it is actually in line with God’s original plan for humankind. So my passion grew from just doing work with women and girls but also seeing men and boys as part of the solution. I have found the past six years extremely exciting, particularly the work we do using the Channels of Hope for Gender (CoHg) tool where the very Bible that others use to oppress women is used to empower faith leaders to challenge gender stereotypes and address GBV. An unforgettable moment is when I facilitated a CoHg workshop in one of our ADPs and a woman came to thank me afterwards because she felt that she had been freed as for years she’d always believed God wanted to use her but her church didn’t allow women to be in leadership and now she was happy because she knew that she was anointed of God and God Himself saw her as a special vessel He could use. You could tell from how she spoke that she was not going to doubt who God created her to be anymore and she was ready to serve Him regardless of the potential challenges ahead. I’ve also come across pastors who have felt they needed to repent for not having given people the right information. And all I can do is thank God for allowing me to be part of the restoration work He specialises in, especially the work related to restoring the identity of males and females created in His image to rule creation and not one another! In terms of educational background, Pontsho has an Honours Degree in Psychology and is in her second year of a diploma in Theology.